October 6, 2015 by Theresa B. Clarke 1 comment on "The 2015 Google Online Marketing Challenge Results from JMU"
Once again, my MKTG 477 and MBA 625 students have shown the world what amazing talent we have at JMU. On behalf of my eight teams that participated in the 2015 Google Online Marketing Challenge (GOMC), I dedicate their recent successes to our strong network of alumni and agency partners. We are extremely grateful to our alumni and agency partners who support this experiential learning experience through guest speaking, mentoring services, and intern/externship opportunities. First, I wish to congratulate Lauren Crain, Dan Froehlich, Morgan MacKenzie Moore (Team Captain), and Brea Zeise for being named Americas AdWords Business Winner in the 2015 GOMC! This marks the fourth time that JMU has won this same award which means they were the top team in the North America, Central America, and South America region of the world. They join the ranks of Rachel Bruton, Meredith Rauh, Brandon Lawlor, Molly Shea, Larissa Cookson, Lindsay Keller, Nicole Behr, Rachel Krause, and Tara Goode in holding this prestigious title. I look forward to our team visit to the Googleplex this weekend as part of their winning package. Morgan Moore, Lauren Crain, Brea Zeise, and Dan Froehlich from James Madison University were the Americas Region Winners and the 2nd Place Social Impact Winners of the 2015 Google Online Marketing Challenge. Second, in addition to winning the Americas region, this same team won second overall in the Social Impact category of the GOMC. As result of this win, their client, the Calvert Marine Museum, a museum dedicated to the collection, preservation, research, and interpretation of the culture and natural history of Southern Maryland, will be given a $10,000 donation from Google. This brings JMU’s total Google Challenge donations earned for non-profits to $50,000! Lauren, Dan, Morgan, and Brea join the ranks of many Dukes who earned one of the top three prizes in the Social Impact category: Scott Guengerich, Melissa Dennis Allen, Jeremy Daniel Vogan, Josh Baugher, Baris Bilek, Chris Foster, Carla Larson Reese, Kelcey Troxell, Xavier Pickett, Craig Honeycutt, Dale W. Richards, Lauren Hale, Ashleigh Rojanavongse, Rachel Lam, Kaci Lassiter, James Carter, Monika Kelpsaite, Carly Calhoon, Aly Wilkins, Rory Salzberger, Kelly Pollhammer, Melissa Kniceley, and Hannah Irene Johnson. 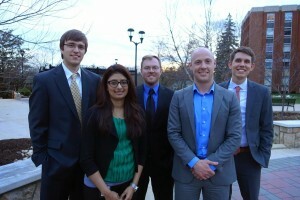 Matt Ropp, Naureen Versi, Glen Hollowood, Taylor Schwalbach, and Chris Meyers (Team Captain) were named AdWords Business Semi-Finalists (top 15 in the Americas region) and AdWords Social Impact Finalist (top ten in the world) in the 2015 Google Online Marketing Challenge. Third, the MBA team of Chris Meyers (Team Captain), Glen Hollowood, Matt Ropp, Taylor Schwalbach and Naureen Versi proved to be strong contenders in the 2015 GOMC by winning two awards. They were named a 2015 AdWords Business Semi-Finalist which means they were one of the top 15 teams in the Americas region on the AdWords component. Students developed a campaign for Friendship Industries, the first organization in our local community to provide commercial work and training opportunities for persons with disabilities. Because they partnered with a nonprofit with public charitable status and they submitted an Impact Statement, they were eligible for the Social Impact Award. Their superior performance earned a second title as a 2015 AdWords Social Impact Finalist which put them in the top 10 teams in the world in the Social Impact category. Finally, the other six participating JMU teams were ranked as a “Strong” team which means the students demonstrated strong AdWords proficiency and understanding of online advertising. Over 1,700 teams competed in the 2015 GOMC and the top 322 teams made it into the Strong, semi-finalist, or winner category. Thus, we can confidently state that all JMU teams performed in the top 20% of the world! I am immensely proud of all of my 2015 students for these accomplishments. But moreso, I am proud of their drive, determination, hard work, and overall performance in my class. Because of their efforts, each team made a meaningful difference through the marketing services provided to their clients. 1 Comment on "The 2015 Google Online Marketing Challenge Results from JMU"